We learned how to use format string vulnerability to leak contents of memory to bypass nx bit, stack canary and ASLR in last post. This time we will focus on what are Procedure Linkage Table and Global Offset Table. As we know all instructions for our C functions like printf, scanf, malloc, system, etc are in glibc. When we call such functions in our code, they are dynamically linked to our binary and then executed unless the -static option was given during compilation. This greatly reduces the size of executable. Let's look a little bit on how it happens. Compile it with '-no-pie' flag. Position Independent Executable (PIE) is an exploit mitigation technique which loads different sections of executable at random addresses making it harder for attacker to find correct address. Addresses in such executables are usually calculated by relative offsets. We don't want that now. Let's load it in gdb and see. 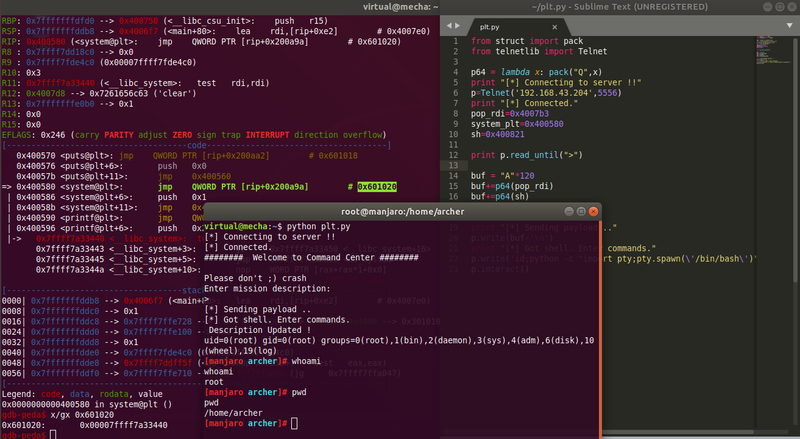 Reading symbols from plt_demo...(no debugging symbols found)...done. You would have noticed while debugging programs by now that whenever we call a function example 'puts'. We see puts@plt is called instead of directly calling the function. You will notice that this address actually belongs to .plt (Procedure Linkage Table) section of elf. Now let's step into(si) 'puts@plt'. We reach puts@plt. Here you can see there is first a jump to $rip+0x200b52 i.e. 0x601018 which is in .got.plt section. But currently it just contains the address to *puts@plt+6. So instruction pointer now points to next instruction in puts@plt instead of jumping to that address. Then it pushes a value on stack and then there is unconditional jump to address 0x4004b0 which also belongs to plt section. Also if you see plt entry of system, it also pushes a value on stack then jumps to that address. Then again it pushes some value on stack and then jumps to 0x601010 which again jumps to another address which belongs to '/usr/lib/ld-*.so' as you can see below and we have finally reached _dl_runtime_resolve_xsavec. So what the hell is all going on here ? What is this ld.so ? Why are we in it ? Let's read man page for ld.so. prepare the program to run, and then run it. Oh ! So this is our magic program which finds the correct addresses of functions in other shared libraries even when ASLR is on and dynamically links it to executable via Global Offset Table. Offsets to global variables from dynamic libraries are not known during compile time, this is why they are read from the GOT table during runtime. There's a lot more on how this happens that you can read. So this way the program counter will reach the correct address of our function in libc or any shared library. The address is then saved in GOT entry of function. So whenever you call the same function again it will jump directly to correct address. You can verify it. When we call the second puts. This time it jumps directly into libc's puts address as the correct address is now written in GOT . Same procedure will happen when other shared library functions are called. Cool. We know how PLT and GOT work. Now how can we (ab)use them ? Since this is a position independent executable the functions and sections in binary will always be loaded at same address. As an attacker we can return to these functions with proper parameters and alter the control flow in our favour to some extent without worrying about ASLR. Check out this simple program, we will serve remotely. It sets no buffering for stdin and stdout. Executes "clear" to clear terminal and then asks some description with scanf. It might do something else with it but that's not important to us now. Compile it without stack canary and -no-pie. We will be running it on server as root so use this command. remote@server:~$ sudo socat tcp-listen:5556,reuseaddr,fork, exec:"./ret2plt"
Since we are working on 64 bit system, we need to pass parameter to system from rdi register. So to execute 'sh'. Address of sh string should be in rdi register. Can we find a rop gadget like pop rdi; ret in binary itself ? So we can return to it first so that address of 'sh' can be popped into rdi and then we can call system. Address of 'pop rdi; ret' instruction. We need to find these in elf only cause the ASLR is on and we don't know libc of remote server. So we will return to self. For 'pop rdi' instruction, I am using ROPgadget tool on executable. Awesome. The instruction is available at address 0x4007b3 in binary. To find 'sh' string you can use strings and grep command or just load it in gdb and find. 0x40080e: "Please don't ;) crash"
If you check, that sh is actually from the end of the string crash. We can use it from address of sh and pass it as argument. Great. Only thing left is to find offset to return address. You can find that with long input or pattern and analyzing in gdb. Found it at 120 bytes. Time to make exploit. Here's what our payload will be. One thing to keep in mind here is bad characters, since there is scanf("%s",desc); in source code from which we will be entering our payload. Here's what man page of scanf says for %s. sequence and the terminating null byte ('\0'), which is added automatically. The input string stops at white space or at the maximum field width, whichever occurs first. So it stops at white space which is 0x20 in hex in ascii table. We have to keep in mind to not have any 0x20 in payload and we will do fine. Putting it all together, here's the exploit script. Fortunately we didn't encounter any bad character 0x20 in payload. Run it against target server and you will get a shell. [*] Connecting to server !! [*] Got shell. Enter commands. Great. We got root as target server was running as root. 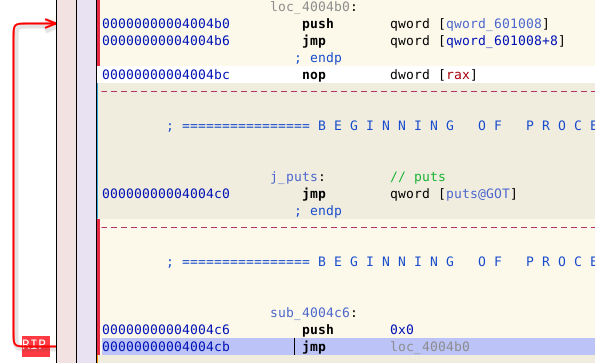 This time we used return to plt to bypass ASLR. We just called system to get shell as it was in the code. You can use PLT and GOT to call more functions without worrying about ASLR and with proper arguments even leak important addresses and memory with them so they can be helpful in further exploitation. We will see more on that in next articles. Keep practicing.